Creating a wedding budget is one of the first things a bride should do. Although it is extremely important, brides often fear the task and in turn do not create one at all. This is a huge mistake. Brides who plan weddings without a wedding budget spend anywhere from twenty to fifty percent more than they anticipated. This can be a financial disaster for whoever is taking care of the wedding bill. So, be a responsible bride and use these helpful ideas to create your own personal wedding budget. A good thing to remember is you can plan a beautiful wedding on any wedding budget. The most important thing to remember is to stick to your budget, no matter if you must forgo things you truly want to include. Will you really remember if you had to use cheap ribbon for your wedding favors instead of the designer ribbon you desired? Probably not, and it is certain your guests won't know the difference anyway. A wedding that has a guest list of over 400 may need a professional wedding planner. However, if you feel capable of taking on the task yourself, then by all means, give it a try. If you start to feel too overwhelmed you can always call in for backup later. A bride can take the total amount she plans to spend on her wedding and divide it for each planning category. This formula is great no matter what your total wedding cost goal may be however it is based upon a $5000 wedding budget. At any time, if you must spend more on one area than the other, then you will have to deduct allotted money from another area to compensate. Try keeping a journal of every purchase you make in order to fulfill you wedding plan successfully. Opening a specific bank account for wedding expenses is a great way to stay on track as well. Brides should set aside no more than ten percent of their total wedding budget for their wedding location rental. Brides who desire church weddings may find that it is sometimes free for them to use their family church. Other ways to save money are to hold your wedding at the home or garden of a friend or family member. The bride should not spend more than twenty-five percent of their total budget on wedding attire. This includes attire for the bride, her attendants, the groom, and his attendants. A good way to cut down attire costs is to ask your attendants to help pay for their gowns and tuxedos. If you simply cannot ask them to help contribute, then you should choose lower costs gowns for them to wear. A total of thirty percent of the total budget can be spent of the wedding reception. Couples usually spend more on the reception than the ceremony because they are entertaining their guests and the reception lasts a lot longer. Decorations can account for twenty-five percent of the total wedding budget. Brides must be very careful in this area, and be sure about their purchases before hand. Many brides waste money in this category simply because they change their minds about the décor several times. A bride with a tight budget cannot afford to be unsure and should wait until they are certain before purchasing. Making your own wedding decorations is a great way to save money in this area. 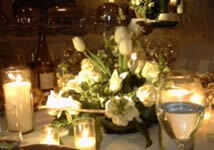 Using creative and easy decoration ideas, you can make your wedding look fabulous for much less. It is a good idea to leave ten percent of your total budget for last minute details or unexpected costs along the way. This is a good way to save money in the case you might not stick strictly with your budget and need extra funds. Now that you know how important your wedding budget is to the success of your wedding, you can be motivated to stick to your plan. Sticking to your budget will not only free you financially but also give you the satisfaction of knowing you planned your ideal wedding by staying in your budget boundaries.